Each battery bank contains two (2) LEDs - a CHARGE LED and an ERROR LED. 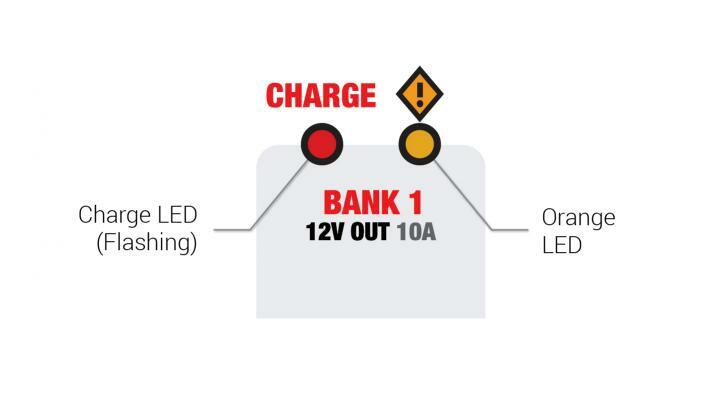 The CHARGE LED indicates the charging process (Red when charging, Green when charged) and the ERROR LED displays a Reverse Polarity or Error Condition. If a Reverse Polarity condition exists, the ORANGE ERROR LED will illuminate. This ERROR condition will be displayed whether the charger is plugged in or disconnected from an AC power source. Reverse the battery connections to fix this ERROR. If an ERROR condition exists, the Charge LED(s) will flash, and/or the ERROR LED with illuminate and/or flash. There are several reasons an ERROR condition could exist. For help troubleshooting ERROR conditions, see the section titled Troubleshooting below. Check to make sure you have a 12V battery. This battery charger is for 12V batteries only. If you attempting to charge a battery that is other than 12V, it could cause this ERROR condition. Charge the appropriate battery to resolve this ERROR condition. This ERROR condition is the result of the battery charger being in the Bulk mode for more than eighty (80) hours. This ERROR condition is the result of a bad battery. To resolve this ERROR condition, take the battery to a local battery store for an evaluation. Check the fuse in the battery connector harness. If the fuse in the battery connector harness has blown, it could cause this ERROR condition. Replace the fuse with a 15A Automotive Blade Fuse to resolve this ERROR condition. Check the battery connections for battery corrosion. If battery corrosion is present on the battery connections, it could cause this ERROR condition. Remove the battery corrosion to resolve this ERROR condition. Check the battery connections to the battery. If the battery connections are loose, it could cause this ERROR condition. Tighten the battery connections to resolve this ERROR condition. If you have checked all other possible ERROR conditions and cannot clear the ERROR, it is probably the result of a sulfated, damaged, or weak battery. To properly diagnose a sulfated, damaged, or weak battery, take the battery to a local battery store for an evaluation. The battery store will advise if the battery can be charged or needs replaced. When No Lights Come On While The Battery Charger Is Plugged Into An Electrical Outlet. Check if the AC outlet has power. If the AC outlet has no or limited power, it could cause this condition. Plug a light into the AC outlet to check if the outlet has power. If the light is extremely dim, this could be the result of limited AC power. The battery charger is designed for use at 70-130VAC. If there is no power or the power is below 70VAC, locate another AC outlet that has sufficient power to resolve this ERROR condition. For safety, if the charger is in bulk mode for 41hours it will automatically stop charging and all LEDs will flash. If this happens, have the battery tested as it might be defective. To restart charging, disconnect AC Power and then reconnect.